I get to have a goofy title for this entry because quite frankly, this is all nuts. I received my feathers this past weekend, a great big plastic bag full of them. I popped it open to inspect my new fuzzies, and found them to be much whiter and les speckled than I had expected. I almost wish I had mixed in some of the darker colored, more tawny varieties, but I am not upset at all with the creamier ones I got. I also noticed that the schlappen is a bit shorter than I had hoped - closer to the 6" width rather than the 8" as noted, but I have a plan for getting the most "bang for my buck" and blending the feathers upward to the empire waist. The feathers are already strung together, in short sections about a yard long. Four or five rows of heavy-duty stitching hold the quills tightly in placed, and in all the unloading of the strips I only lost one tiny feather in the lots of them. Here you see them layed out on the couch, on top of a pillow. Much sticky-rolling commenced after packing the feathers away...they are shedding bits of this and that, but a good shake should have it all out. 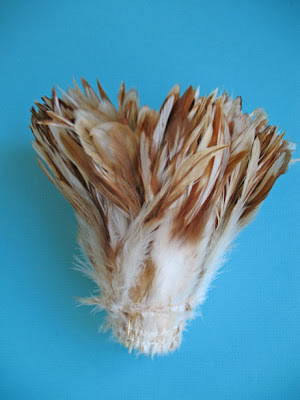 The tawny-colored bleached goose feathers add just the perfect amount of gold. I am so happy with how this all looks together! I suspect the goose feathers to be way too large, so I plan to prune them down and "split" them up to make multiple bits of feathers of smaller sizes to help blend into the skirt. 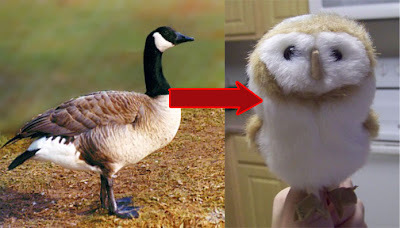 The best of the goose feathers, as well as the real owl feathers, will be save for the head dress. To keep all this plumage safe until it is needed, I put it all in a low, long box used for under-bed storage, and there they shall remain, safe from roving puppies, until it is time to start stitching them on. ...or "Changing Birds in Mid-Stream." 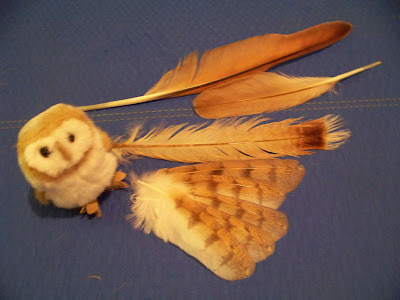 As you all know by now, I have been amassing to me a legion of feathers for the Halloween barn owl costume. 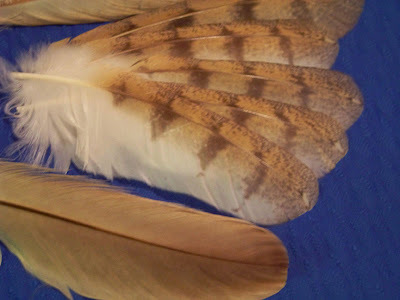 The rooster schlappen has been ordered, the beautiful barn owl feathers from Leimomi have arrived, the other barn owl feathers in Reno are waiting to be retrieved....but is that enough for me? A couple weekends ago, at the Le Societe de Pique-Nique event at Rengstorff House in Shoreline Park, our party took a little walk over to a nearby lake, where we were assaulted by 10000 pounds of goosepoop and an army of goose feathers. From the looks of it, there had been some massive goose battle recently, and the ground was littered with wing feathers. Like a kid in a candy shop, I scampered around picking them up - and Craig obligingly did as well, bless his heart - and I ended up with a grocery bag full of Canada Goose feathers of varying shapes and sizes. 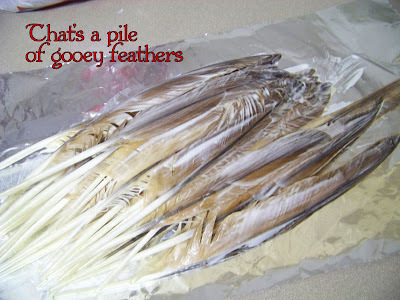 Step 1: Prepare the Feathers. Wash them. 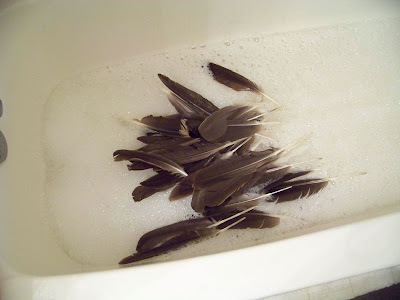 Toss them in the bathtub, drizzle in some dishsoap, and work it through each feather. Rinse them thoroughly. Pat them dry on the towel. Depending on what kind of feathers you have, they will react differently when wet - I tried a couple turkey feathers along with my goose, and the turkey feathers were miserable wet sticks while the goosefeathers, of course, kept their shape and were fairly water-repellent. Step 2: Prepare the bleach kit according to the directions. I hate when I read tutorials that say that, so I'll tell you what to do. Pour the 4 oz. 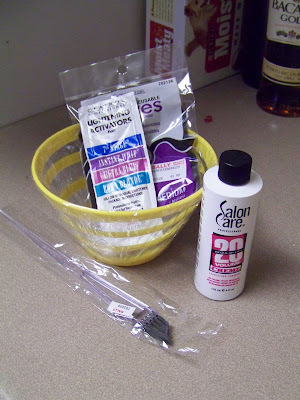 bottle of peroxide solution into the bowl, then stir the packet of powder in. Mix it well. 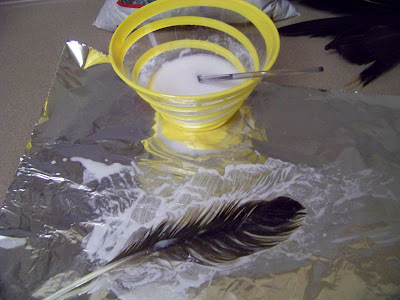 Step 3: Slather it on the feathers. When you're "painting" the bleach onto the feathers, make sure to get it between the little hair of the feather. The application brush you bought has stiff bristles, so it's pretty easy. Brush the goop on BOTH sides of the feather. Wear clothes you won't mind getting bleach on. Step 4: Let 'em sit. Half an hour is about right. You'll see the color changing, and the longer you leave it on the lighter the color will get, but don't leave it on for TOO long (an hour) because the bleach will start to eat the feathers. Step 5: Wash them out. A hand-held shower head works perfectly for this. You want to rinse all the bleach out, but don't worry about washing with soap, shampoo, or conditioner. Pat the feathers dry on the towel and leave them to air-dry. When they're dry, "pet" them to fluff them back up. If you're working with less-forgiving feathers than goose, you can blow dry them and fluff at the same time. Use a rat-tail or mustache comb to comb out the hairs, then just pet and work the hairs back together. There you have it! Now your feathers are ready to be dyed or "painted" (in my case). You may have noticed that the feathers did not bleach to white. 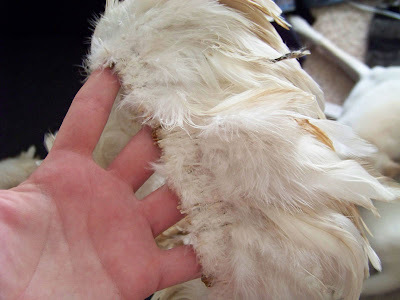 Very dark-colored feathers will not make it all the way to white. Instead, they'll turn golden, which in my case is exactly what I wanted. Feathers work just like hair - if your hair is black and you try to bleach it blonde you'll end up with orange. 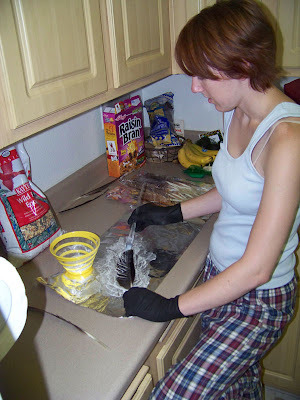 If you're preparing your feathers for dying, the golden ones will still dye to brilliant colors, but not yellows or peaches, nothing lighter in value than they are already. 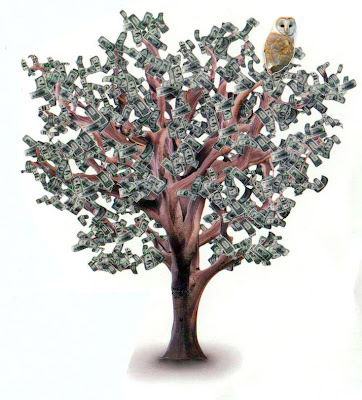 Goose feathers at top, turkey in middle, barn owl feathers below, pictured here with a rare and dangerous wild owl. Next up I will be "painting" the feathers - adding on the spots and bars that Barn Owls have on their plumage. I've got a couple ideas for this, one of which already failed (RIT dye.). Look for a future post! ...And Can't Get For Your Machine. I was full of glee today when I discovered such a thing as a binding presser foot for home sewing machines. 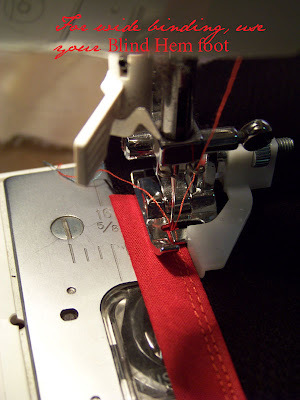 Visions of perfectly machine stitched bias binding zipping through my Singer at a rapid rate thrilled and delighted me. I remembered the handful of specialized presser feet that came with my Singer sewing machine, mysterious bits of hardware that I have never used, and felt quite sure that one of those devices was indeed a binding foot. Upon arriving home, I dug into the accessory box and pulled out all the presser feet, then flipped open the machine's manual (yes, I still have it!) to see about my new treasures. The zipper foot and magic 1-stop-buttonholer I already knew about; also included was an overcasting foot, a rolled hem foot, and a blind hem foot........but no binding foot. "I'll order from Singer online, a 1/4" binder and a 1/2" binder," thought I. I merrily punched in the model number of my machine and found the "Available Accessories" page, which listed all manner of ghastly expensive yet highly intriguing feet that did all manner of thing from ruffling to cutting: all except binding. They aren't made for my machine! No. Binding. Foot. For. Me. The nice thing about the overcast foot is that it has a spacer, a little bit of metal that you line up the edge of your fabric with to keep it all at an consistent interval. 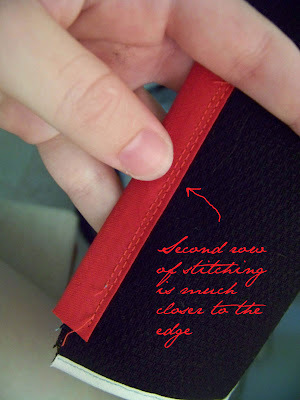 By placing the encased edge of the fabric (the bias folded over the edge of the fabric, with the fold against the spacer) against the spacer, and moving the needle to the far left, as indicated and necessary for the function of the foot, I got a stitch pretty darn close to the edge. 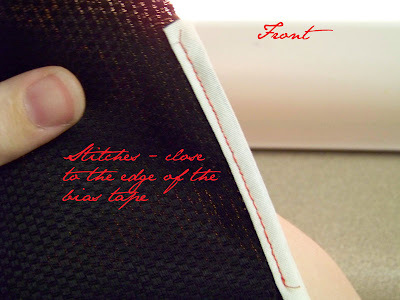 The example here is on 1/4" wide bias tape. Now to test the 1/2" wide bias with the overcast foot. 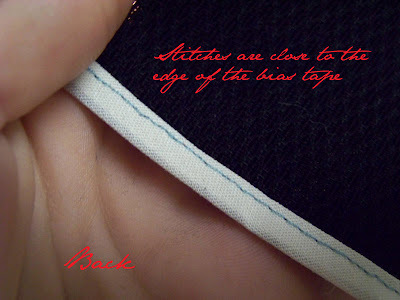 As you can see, the stitching line was not nearly close enough to the edge, even with reversing the edge of the fabric, placing the open edge of the bias tape against the spacer. 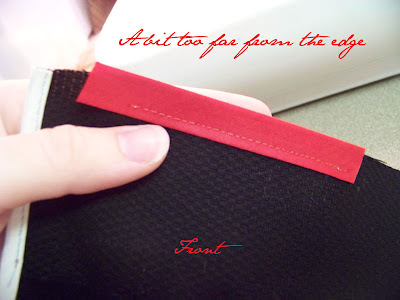 The fix: use the Blind Hem Foot instead. 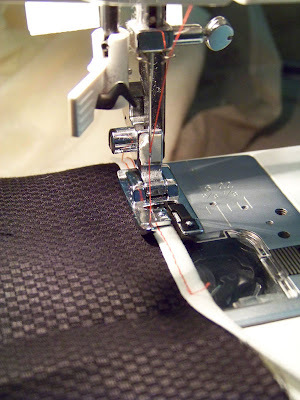 This foot has an adjustable spacer, and in combination with moving the needle to the closest possible setting, a nice close stitching line can be achieved. Anxious to try it on a "real" garment, I retrieved my 18th c. stays from the backburner and tried out the overcast foot on the 1/4" tape. One side had already been painstakingly stitched by hand, which allowed me to really pull and stretch the tape over the edge. I managed to pick the hardest thing to test this method out on - the top edge of the corset has a very organic set of curves which required quite a lot of muscle to maneauver! I am happy with the result, and with more practice and a less insane edge to bind, I predict even better results. 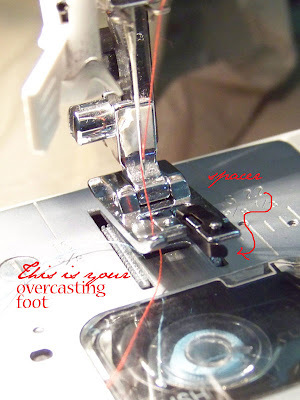 So remember, if you are one of those unlucky seamsters who have a machine for which a binding foot is NOT made: overcast foot for 1/4" binding, and blind hem foot for 1/2" binding. Good luck! If you read last night's tedious entry about feathers, you might have been shocked by how much money I just spent on feathers. I was a little shocked myself as I punched in my credit card information, but as I thought later about what I had done, I realized that I have spent less on costuming this year-to-date than it seems. I have been determined this year to start using fabrics from my stash instead of amassing more, and thus spending more money. By using stash fabrics, I've saved myself a bundle. True, I bought those fabrics at one time or another, but some of that yardage was purchased literally YEARS ago, and for discount prices then. Some was given to me (old sheets for lining fabrics), and some had been made into dresses, then deconstructed, and re-made. 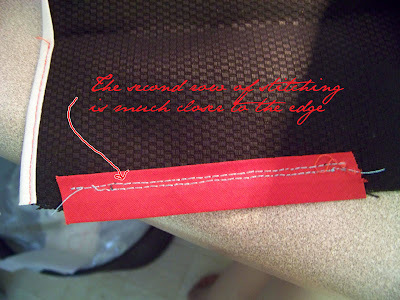 In addition to using stash fabrics, I have also been very good about using stash trims and stash notions. 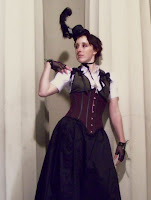 Everything from scraps of ribbon, to hook n' eye tape, to bias in sometimes interesting colors was dug out, used, recycled, cannibalized (like that corset busk), and only seldom added to with newly purchased items. I have not been so good with all of my costumes thus far. 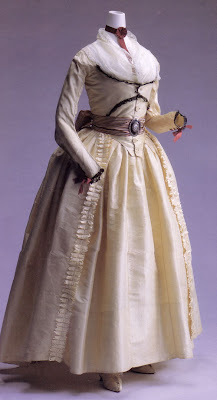 The 1850s ballgown was completely new, as was the 18th c. wool coat, and the recent 1795 robe and gown. However, with these costumes, I tried very hard to use minimum yardages, or buy decently priced fabrics - I never like to pay more than $10/yard for, well, anything. It is true that I am now making more costumes-per-year than ever before. I blame this on Maggie. Thus I am spending more money overall, but I have also a full-time job now, which allows me disposable income (however meager) that I get to spend on basic survival and the things I love - costuming, my puppydog, and dancing. Another factor in allowing myself the cost of the feathers is that I hope to auction the robe when it's all over and donewith. Will it sell? No idea, but I'm still going to try. Partially this is to recover some of the cost of the gown, but also because it's such a unique piece that I cannot see that I would wear it often enough. Instead it will just sit in my closet, so why not pass it on to someone who will adore it, wear it, and maybe then in turn sell it? What do you all think? Having survived the first half of the year's costuming rushes and events, it's time, at last, to start collecting materials for this year's Costume of Insanity, the Barn Owl Halloween costume. Back when I first started this blog, I did a rough estimate on the number of feet I would need of strung rooster schlappen. 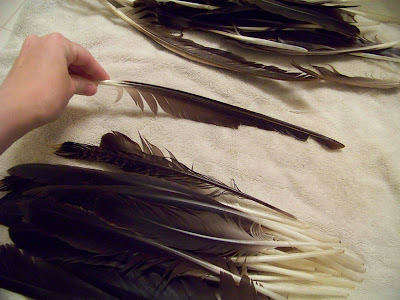 Click HERE to read about strung schlappen, and HERE to read about my initial estimate of cost for these feathers. Of course, this was some time ago, and the design of the robe has changed to include a longer skirt, from an empire waist. 60"(L) / 3" = (20 rows)(68") = 1360" / 12 = 113.3 feet. 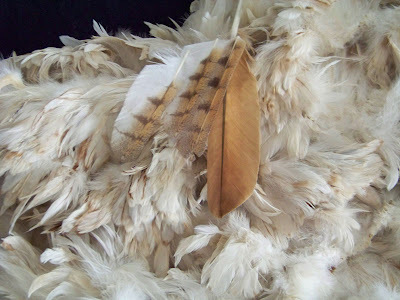 Feeling proud of myself, I went to the Lamplight Feather website and saw that the feathers I wanted were sold in 12 foot bundles for $86.50, a discount-per-foot for the bulk order. Back to my needed footage of, rounded up, 115 feet, I divided that number by 12 to get the "quantity," then multiplied the quantity by the price, $86.50. Then a heart-attack ensued and I fainted for 2 minutes. The total was $830!!!!!!!!!! Feather cheat #1 - I saw on the description of the feathers that they are 6" - 8" wide. I cut out three pieces of 7" wide paper, and lapped them at what looks like an acceptable overlap, changing my increment from 3" to 5". Punched into the formula, this still came out to $484.40! At a 6" increment, it came out to $407.41. 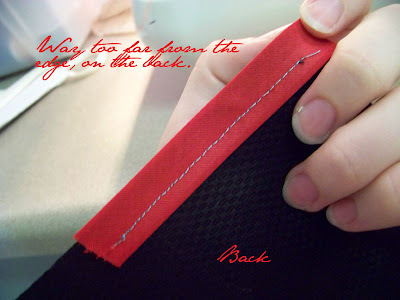 Feather cheat #2 - reducing the double and triple box pleats in the back. 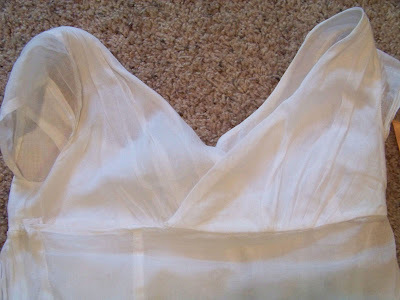 This reduces the width of the skirt. The 5" increment, with a 48" wide skirt came out to $346; the 6" came to $288.30. Doing better, but still not where I wanted it. It then occured to me that the method I am planning for blending the feathers into the openings of the pleats will cover any double box pleats I might have painstakingly put in. In other words, what would be the point of having anything more than singles? 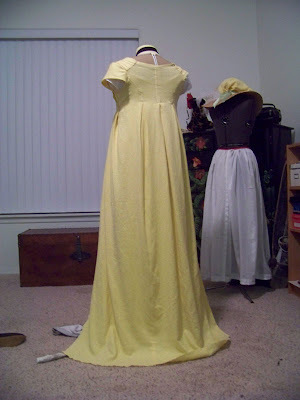 I used single box pleats on the yellow mockup of the robe, and they turned out the be lovely indeed. Reducing down to 3 single box pleats lowered the price still. Feather cheat #3 - bring up the train. At 60", the train of the robe was a good 10" longer than my yellow linen mockup, which trailed the ground quite nicely at 50". I had planned to add a black hem guard to the feather robe, fairly deep, so for my final calculation I shortened the train back to 50". All those calculations later, I got to $242.20. Rounded up (a quantity of 2.7 to 3), add the shipping and the tax, and I've come in at $290.91. This is more than I wanted to pay. It is by far the most expensive piece of frippery I've ever tried to make. The hope and plan is that I will be able to auction the robe on eBay, or sell it on Etsy, but my hopes are not high for that. Maybe I will hold onto it for some year when I go to Carnevale. 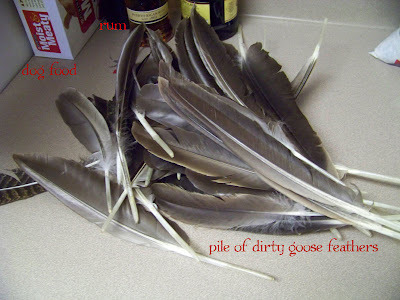 More good news: I've acquired a large number of canada goose wing feathers, and quite a few turkey feathers. 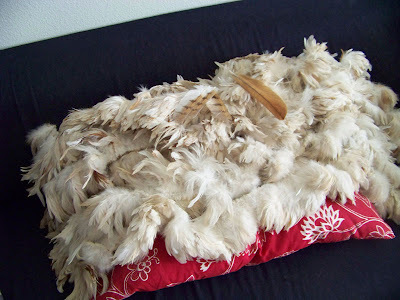 I plan to bleach the goose feathers and "paint" them with hair dye to resemble owl feathers. These will be used on the mask, in addition to a billion other feathers (some of them real owl feathers courtesy of The Dreamstress), and I may try to blend them into the skirt in places, either near the top, or towards the bottom. The dying of feathers will be an adventure in itself, and is sure to be followed by funny pictures and a tutorial! For some time now I've had the Kyoto Costume Institute's book...the miniature version. It was not until this afternoon that I finally received the KCI "big book," quite literally a costume "bible," and a must-have of any historical costumer. "Fashion: A History From the 18th to the 20th Century" is not a book of patterns. It is not a how-to. It is a catalog of gown, masterfully photographed, from one of the largest collections of extant historical garments in the world. It is a treasure-trove of visual information, with every page in full-color, often showcasing garments and styles not usually associated with the "stereotypical" modern view of the 18th c.
1780 Robe a l'Anglaise. White, Pink, Green striped silk satin. Fastens at the front with hooks and eyes. I love the little miniature pinned onto the whitework fichu. The petticoat looks to be green quilted satin. 1780s Caraco (jacket) and Petticoat - Jacket is blue silk taffeta, fastened at the front with hooks and eyes. The petticoat is silk faille with chinoiserie (asian-influence) embroidery. 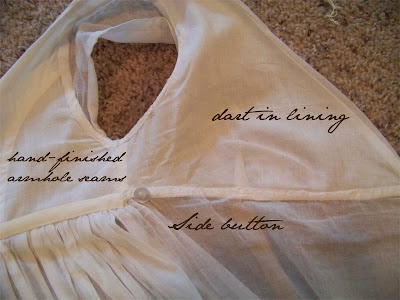 1780s Robe Retroussee dans le poches. That's a mouthful. This means that the skirt was pulled up through the pocket openings at the waist of the skirt, forming these "pooches," as I like to remember it. This was a precursor to the polonaise, which was held up with cords. The dress is triped silk faille with a moire effect. 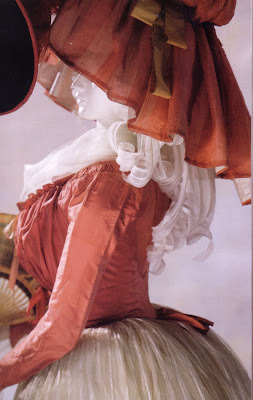 1780s Robe a l'Anglaise. 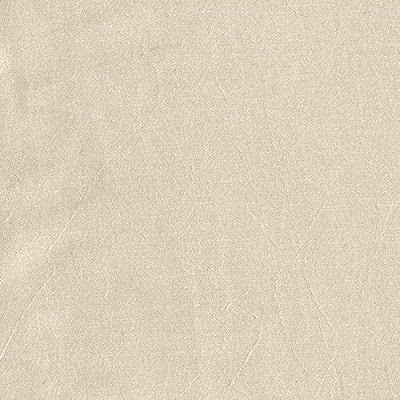 White cotton chintz (yes, cotton!) with Indian floral print (yes, print!). 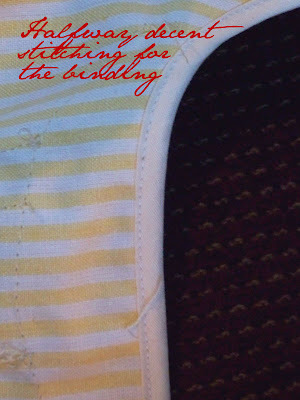 Laces in the front (hidden lacings, I assume). The border of this gown is a separate printed fabric sewn on as an edging, like a piece of ribbon or binding. 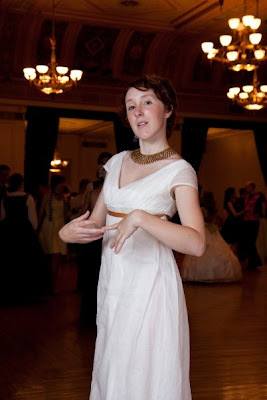 Here is a photo of a recreation of this style. 1790 Jacket. Those of you familiar with this book will know that the companion to this pink jacket, a teal jacket with gilet, is also a must-have, and is one of the most reproduced costume pieces in 18th c. films, theater, and private costuming. This pink jacket, however, is just as noteworthy, as it is a peculiar style not seen nearly as often, but cute to boot! Pink silk taffetta, with a drawstring neckline, and a front-lacing belt at the waist that pulls the waist taught from the side-back seams. 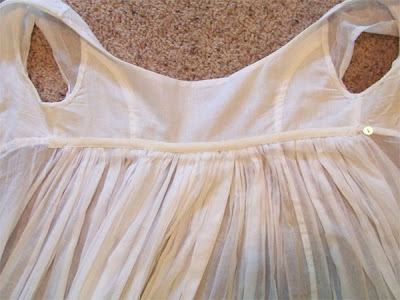 It appears to be worn over a sheer skirt with thin white stripes (voile or silk). The matching hat is killer too! 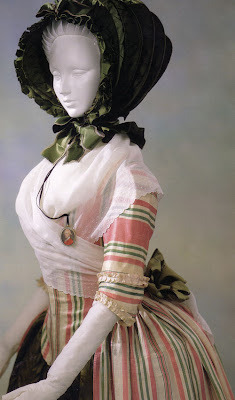 1790s Robe a L'Anglaise. 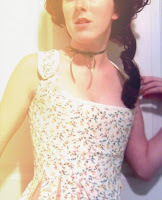 I call this one the "Revolution Dress," and it's one of my favorites from the book. 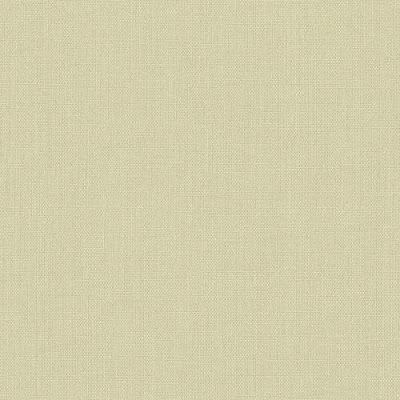 Cream silk taffetta, with a zone/turque-like front and button closure. Black lace decorates the front of the bodice and the cuffs, the latter lacing with wine-colored ribbons. 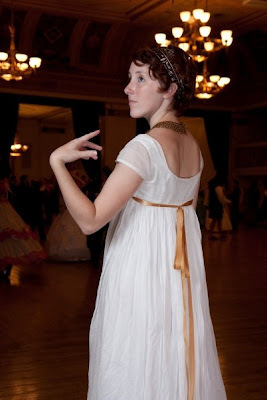 The sash sports a metal buckle with a painted porcelain center, on a striped silk sash. 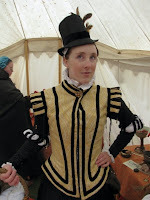 "Diary of a Mantua Maker" has made a version of this gown: click here to see it. 1790-95 Round Gown Dress of subtley striped Indian muslin with silver embroidery. The sash belt is silk woven with silver thread. I love this gown for its simplicity, but also because it is a-typical: notice the turn-back lapels at the neckline. The turban head gear is off-the-charts as well. 1795 Dress of plain-weave linen (linen!) with a beautiful printed floral pattern, worn over a petticoat of white muslin. The blue bow at the waist is a perfect touch. 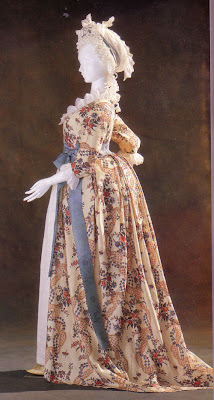 Interestingly enough, the printed fabric of the gown is from 1770. This is a great example of a garment that has been remodelled to fit the new styles. Some of these amazing printed textiles can be approximated - ReproductionFabrics.com has some superb printed cottons.